Food is directly related to health and this is evident from the phrase healthy eating. If you eat healthy you remain healthy. But healthy eating doesn’t mean to abstain from food or consume tasteless meals. Food has been an intrinsic part of the cultures of the world. If you are a foodie then you will certainly want to subscribe Clean Eatingmagazine that introduces recipes, diet plans and everything that is related to food to people.And it won’t be an exaggeration to say that the magazine celebrates food in the most beautiful form. It is all about the celebration of food. The magazine has one objective that is toteach foodies and health-conscious folks about how to consume whole food while keeping it natural as far as possible. While other publications regarding food publish recipes difficult to understand and prepare, the Clean Eating keeps its approach doable. It wants the readers to learn ways to cook food in a simple yet creative manner that it improves the natural flavor of the ingredients while keeping the nutritional value of the food intact. The magazine is about real food and not diet but it can give a clean diet. It is all a food-magazine has to offer but with Clean Eating, it becomes a beginning or, rather, a learning activity. And the magazine has recipes divided into different categories to suit individual needs and tastes. For example, it tells about quick and easy recipes that are easy-to-cook and delicious in taste. Similarly, there are budget-friendly recipes; gluten-free, vegetarian and classic recipes and much more. You can keep exploring and adding the recipes to your plate. What’s your meal plan tonight or for the coming week? Wondering about how to make a plan? If yes then look at Clean Eating. Those who read this magazine don’t have to think of a meal plan as they have plenty of options to choose from. For example, take a plant-powered week. This plan is about plants but it would be belittling the benefits of this plan to call it vegetarian. Similarly, there is a meal plan to fix guts. It is a week-long food chart helpful in controlling the gut issues. This part is for health-conscious folks. If you want to eat for healthy living or achieve your health goals with food then this part is for you. Clean Eating has multiple columns for health conscious people. You will learn many things about diet and food from these columns. And you will learn many things for the first time. In the beginning, we called Clean Eating a lifestyle magazine and this is proved with its columns under clean living. Here you will find many products that can bring positive changes to your life and there are many things that are related to health and beauty. A magazine like Clean Eating is no less than an expert but it has associated many food experts to help its readers and together these experts make the magazine more interesting. Whether you are a foodie or a health-conscious person, Clean Eating is a must-have magazine for every home. Also, it will be a nice addition to the collection of coffee table books. 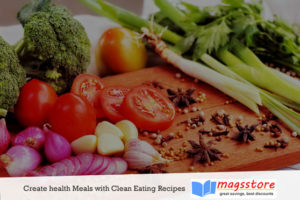 For Clean Eating magazine subscription, you can visit Magsstore.com. Next story What makes The Economist the widely read news magazine?